Since Deliveroo launched in Australia in November 2015, new-generation delivery apps like UberEATS and Foodora have joined the aforementioned in taking the nation by storm. The apps have been so successful, that their penetration has surged by nearly 900% in just 18 months and have changed the way we eat in unprecedented ways. For the uninitiated, these new services are third-party apps through which users can have food delivered from establishments that otherwise wouldn’t offer delivery. Orders are placed directly through the app before they are picked up from the eatery and delivered to the consumer’s door. Pocketbook analysed the spending habits of 200,487 customers since these apps entered the market to find out first hand how the convenience and choice they offer have proved hard to resist. The ability to enjoy favourite dishes from higher quality establishments, in the comfort of our own homes, has led to more Australians using the services more often, spending more money per transaction as a result. Data for this analysis was gathered during work to update Pocketbook’s application. As part of the update, Pocketbook developers built a new categorisation engine which enables more accurate and granular levels of data segmentation, giving Pocketbook’s 350,000 users greater control over their personal finances. It didn’t take long for Australians to grow comfortable using Deliveroo, UberEATS and Foodora. In just 18 months, users were spending 61.45 per cent more per month than when these services entered the market (from $49.84 to $80.47). 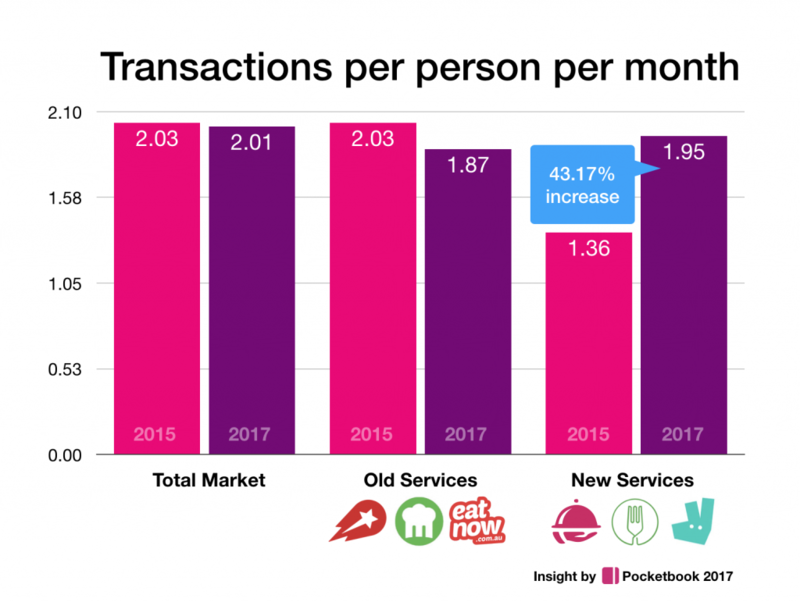 Over the same period, Old Delivery Services (Menulog, EatNow and Delivery Hero) witnessed an almost five per cent decline in the amount users spent per month. Pocketbook’s full findings are below. The ease, convenience and choice New Delivery Services offer has led to an increase in the number of transactions per user, with customers using the new apps twice per month (1.95 times) on average – an increase of 43.17 per cent. Conversely, Old Delivery Services witnessed a 7.95 per cent decline in the number of transactions per user over the same period. Deliveroo, UberEATS and Foodora have caught on rapidly in Australia. 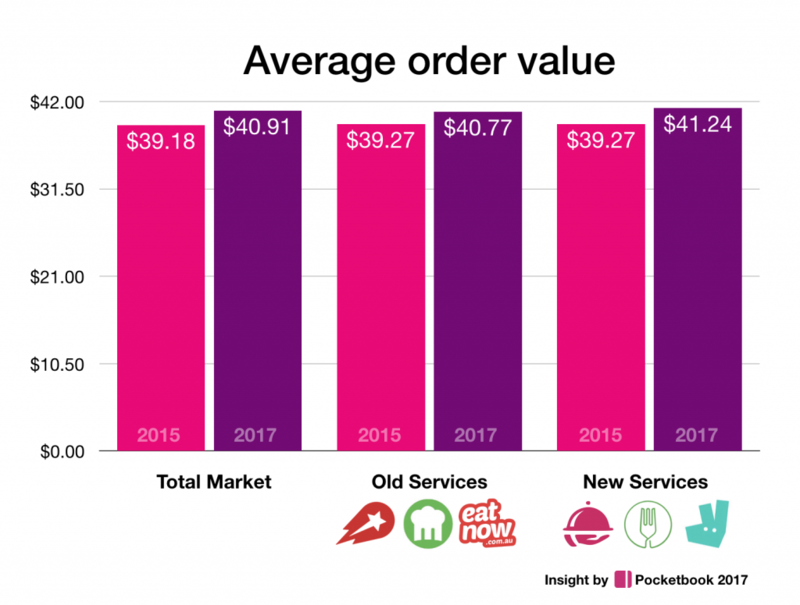 In just 18 months, usage of these New Delivery Services has exploded – their penetration surging by 877.85 per cent – encompassing more than three per cent of Australia’s population as of June 2017. Australian consumer behaviours seem to have changed with the entrance of these New Delivery Services to the market, with more than 10 per cent of the population opting for delivery in June 2017 – an almost 50 per cent increase from November 2015. 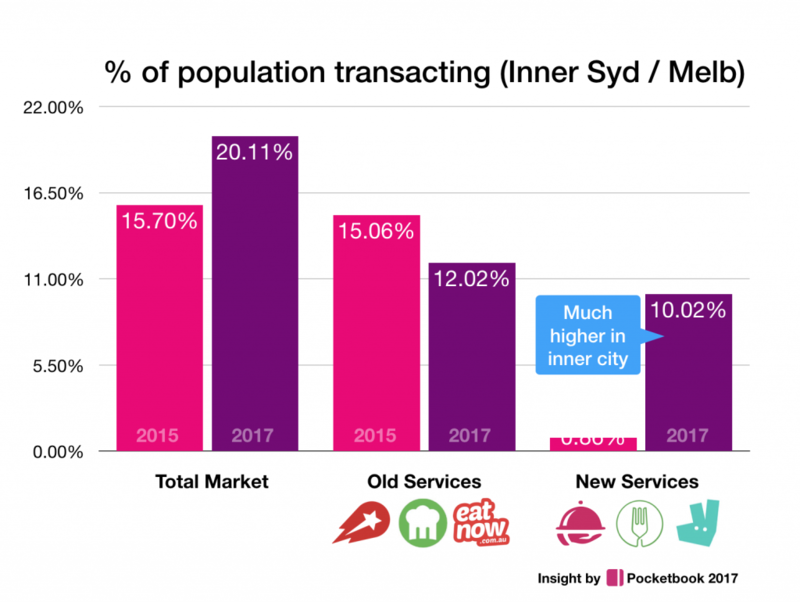 The impact Deliveroo, UberEATS and Foodora have had is most pronounced in Inner City Sydney and Melbourne, partly because these services launch in these regions before expanding to other areas. 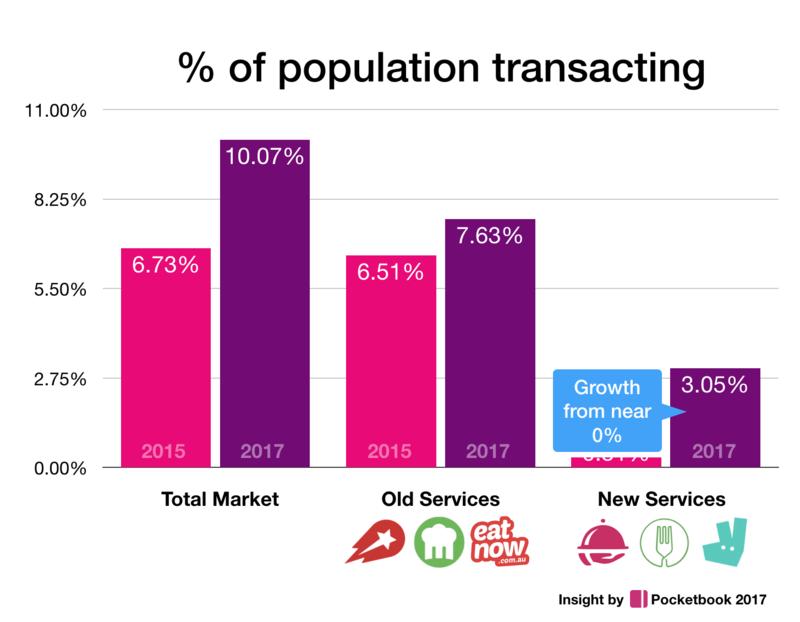 Pocketbook’s data reveals that since the New Delivery Services launched in November 2015, their user base has surged more than 10-fold in Inner City suburbs – now commanding more than 10 per cent of the Inner City population. During this time, Old Delivery Services experienced a 20 per cent decline in their Inner City user base. Across Australia, the penetration of these New Delivery Services has surged by more than 800 per cent since November 2015, with over 3 per cent of Australians using the apps. Old delivery services increased by 17.35 per cent over the same period. In June 2017, more than 10 per cent of Australians were using either the Old or New Delivery Services – an almost 50 per cent increase from November 2015. Inner City suburbs (where the apps initially launched) experienced an even more dramatic increase, with New Delivery Service penetration exploding more than ten-fold (1069.56 per cent). In June 2017, more than 10 per cent of Inner City residents were using these apps. Old Delivery Services witnessed a 20 per cent decline over the same period in Inner City suburbs. 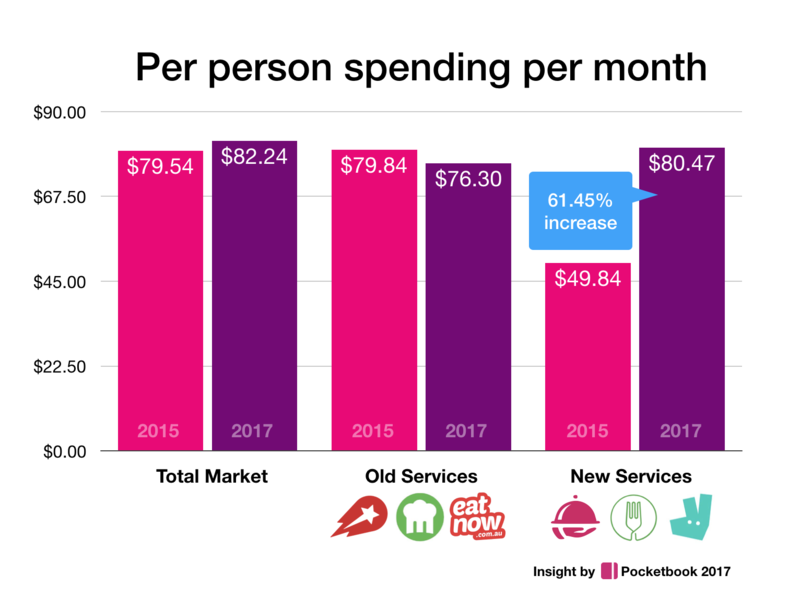 In just 18 months, users were spending 61.45 per cent more per month on New Delivery Services (from $49.84 to $80.47). Over the same period, Old Delivery Services witnessed an almost five per cent decline in the amount users spent per month.